The players themselves came up with another way of fostering team chemistry: They called it the 5 o’clock club. A tradition that actually began when Vince Lombardi came to the Redskins in 1969, a group of players would gather after practice at an equipment shed at Redskins Park as a way to fraternize and drink some beer. Sometimes a lot of beer. Lombardi’s 5 o’clock club in Green Bay was a time-honored tradition, when the coach would invite reporters to hang out after training camp practice and the night before road games. Lombardi would have his drink—scotch and water—and reporters would drink beer and just shoot the breeze with the coach. That would be an unheard-of arrangement in today’s NFL, where reporters are kept as far away from head coaches as humanly possible, but in those days, there was a much more collegial atmosphere where coaches could trust reporters to respect the rules of engagement: namely, that all conversations would be off the record. 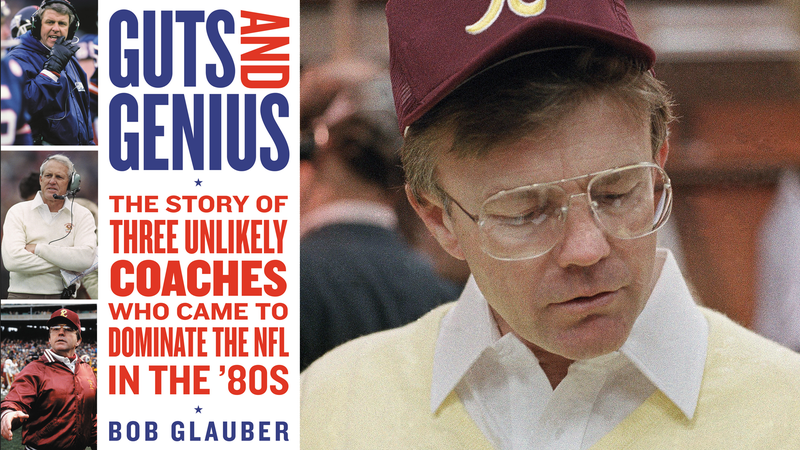 An adapted excerpt from Guts and Genius: The Story of Three Unlikely Coaches Who Came to Dominate The NFL in the ’80s. Copyright © 2018 by Robert Glauber. Reprinted with permission of Grand Central Publishing. All rights reserved. The Redskins’ iteration of the 5 o’clock club was eventually a gathering for players and assistant coaches and the training staff, and by the time Joe Gibbs had arrived as head coach in 1981, there were several regulars: running back John Riggins, defensive tackle Dave Butz; newcomers Jeff Bostic, Russ Grimm, Joe Jacoby, and Mark May; along with most of the other offensive linemen, some defensive linemen, and a handful of coaches and trainers. “We had officers and everything,” Jacoby said. “I was sergeant at arms. Riggins was ‘El Presidente.’ It wasn’t a democracy, though. We did have some coups.” Other officers were Grimm, Bostic, and Butz. Jacoby said it was a good way of releasing tension. The ball busting was endless. “One time I asked Grimm, ‘Russ, when’s the last time you played a complete game?’ He thought and he thought and he said, ‘Three years ago.’” The room filled with laughter. Keeping the quarterback out was good for team chemistry? Actually, it was. Especially Riggins, who never hid the fact he liked to drink. “One time in the meeting room, John asks if I can pick him up in the morning,” Bostic said. “You got car problems?” the center had asked. “I knew it was out there, and they kept it under cover,” Gibbs said. John Madden became a frequent visitor to the 5 o’clock club when he met with the Redskins before broadcasting a game on CBS. The players loved having him there. Madden made the mistake of talking about the club on one of his broadcasts. They called it simply the body bag game. It infuriated the normally mild-mannered Gibbs, who was as competitive a coach as there ever was, but who never resorted to making incendiary comments about opposing teams. It wasn’t just the pregame words, either. One after the other, Redskins players were indeed carted off the field with injuries. Starting quarterback Jeff Rutledge, who was playing in place of the injured Mark Rypien, suffered a broken thumb. Rutledge’s replacement, Stan Humphries, left with a twisted knee. Running back Gerald Riggs suffered a sprained foot. Wide receiver Joe Johnson suffered a concussion so severe that he had to be taken off on a stretcher. In all, nine Redskins players had suffered injuries. By game’s end, rookie running back and kick returner Brian Mitchell was the team’s quarterback. “They killed almost everybody we had,” Gibbs said. “I don’t think I’ve ever been involved in a game where so many players went down,” Gibbs said afterward. “It seemed like every play.” It was one of the low moments of Gibbs’s run with the Redskins. And it wasn’t just the fact that his team had fallen to 5-4 and the coach was uncertain whether he’d soon be out of the playoff hunt in a division that already included the Giants, who were 9-0 by then, and the Eagles, who were also 5-4 but had a talented enough team to make a late-season run to the tournament. Gibbs had rarely been so upset by a game and by an opposing coach’s behavior. He understood losing was a part of the deal, and he’d suffered some crushing ones at various times. But to have a coach speak of his team—or any team—by using the term body bags, and to then see all the injuries pile up and hear one of Ryan’s players ask if they needed any more bags ... well, that was simply over the line. “Joe had been embarrassed on national TV, and it really bothered him,” former Redskins public relations director Charlie Dayton said. His players saw Gibbs’s anger. They were just as pissed. “I remember Joe Johnson getting knocked out on a punt return. I mean, when [the trainers] got out there, he was snoring,” said former Redskins guard Mark Schlereth. “And the Eagles were celebrating. We all celebrate big hits, you celebrate football and toughness. But when the other team is celebrating like that, you feel like they’re celebrating an injury. Gibbs’s unwillingness to swear was legendary among his players. Some of them even tried to make him swear, but the coach would never go there. Gibbs would soon get his shot at payback against Ryan. The Redskins and Eagles both went on late-season runs to finish 10-6 and earn wild card playoff berths behind the divisional champion Giants, who went 13-3. It would be Redskins-Eagles once more at Philadelphia’s Veterans Stadium in the first round. The Eagles had practiced for part of the week in Tampa, partly due to inclement weather in Philadelphia, but also because Tampa was where Super Bowl XXV was to be played, and Ryan wanted his players to become accustomed to the area. That infuriated Gibbs, and he shared his disgust for Ryan’s bravado with his players during the week. Gibbs would avenge the body bag game the best way he knew how: on game day. The Redskins beat the Eagles, 20–6, to advance to the divisional round against the 49ers. After falling behind 6–0 on two Roger Ruzek field goals, the Redskins’ offense got in gear behind quarterback Mark Rypien, who had replaced Williams as Gibbs’s starter in 1989 and had returned from a knee injury late in the 1990 season to help get Washington into the playoffs. Rypien heated up in the second quarter, finding Art Monk for a 16-yard touchdown to give the Redskins a lead they would never relinquish. Rypien led two field goal drives to make it 13–6, and then finished off a 20–6 win with a third-quarter touchdown pass to Gary Clark. “We want to win the right way and lose the right way,” he said, a clear shot at Ryan. Ryan, who never won a playoff game in Philadelphia, was fired four days later. The Redskins were clearly the class of the NFC East in 1991, and they tore through their early-season schedule with the kind of proficiency rarely seen even on Gibbs’s best teams. They streaked to an 11-0 record, with Mark Rypien enjoying by far his most productive season. His lead runner was former Browns tailback Earnest Byner, who had been known more for his costly fumble in the 1987 AFC Championship Game. Gerald Riggs, the former Falcons first-round pick, was also in the backfield, and Ricky Ervins was a solid changeup back. Art Monk, Ricky Sanders, and Gary Clark comprised a dangerous three-pronged receiver set. And that offensive line kept Rypien clean the entire season. Rypien would drop back 421 times that season and was sacked only seven times. That’s an insanely low number, and one that allowed him to operate Gibbs’s offense at peak efficiency. The defense, meanwhile, was as good as at any time in the Gibbs era. Charles Mann had come into his own as a terrific all-around defensive end. Darrell Green was the best cornerback of his generation, a player who could take any great receiver out of a game with one-on-one coverage. Linebackers Wilber Marshall, the former Bears star for whom Gibbs had surrendered two first-round picks; veterans Kurt Gouveia and Monte Coleman, and rookie Andre Collins were the best collective group in the league. This was as good as Gibbs had felt about his team in a long, long time. Maybe ever. Hanifan said Gibbs was delighted the 5 o’clock club was no more. That’s right. Hanifan, a welcome guest at the 5 o’clock club, told Gibbs the players were still throwing back beers at the facility. “We were right below his office,” Bostic said. Gibbs was willing to overlook it, though, because things really were proceeding as smoothly as they had in years. Bob Glauber is Newsday’s national football columnist. This adapted excerpt is from Guts and Genius: The Story of Three Unlikely Coaches Who Came to Dominate The NFL in the ’80s. Copyright © 2018 by Robert Glauber. Reprinted with permission of Grand Central Publishing. All rights reserved.